There's probably plenty to keep miners thoroughly entertained as it is in Minecraft: Windows 10 Edition Beta, however, Mojang have added more content to the game to further expand the creativity and playing time for keen crafters. Players will be able to create ever more blocky goodness with the addition of redstone components, explore all-new desert temples, find and collect four types of rabbits, and enjoy a few more creative options too. Mining blocks of this very useful, rare material produces a substance called redstone dust. This dust can then be used to carry signals between objects and build some of the more advanced items in Minecraft. Players can make a wire out of redstone dust by placing it on blocks next to each other. By adding a redstone signal and components, players can create anything from doorbells to switchable lights to mob grinders to rollercoasters.Three groups of “simple redstone items” will be available including redstone wires, torches and lamps. Players can also use “levers, buttons, pressure plates, tripwire hooks, note blocks, trapped chests, detector rails and TNT”. If you've already mastered the art of advanced redstone, you will still be able to enjoy other advanced blocks such as Pistons and Repeaters. More blocks will be added in future updates when the final two groups of redstone functionality are released. Redstone is the main feature of the update but Majong has also treated fans to a little bit extra with Desert Temples and Rabbits. 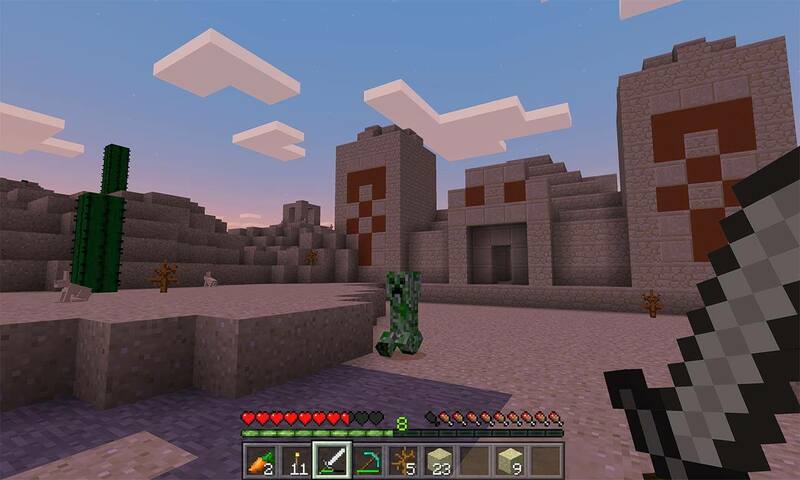 As adventures explore desert biomes, mysterious desert temples will spawn from the sands. Players can give in to the temptation of exploring these structures and finding and grabbing some precious loot. Reap the rewards if you can make it back out of the temple alive. The newly introduced rabbits will come in six types. Mojang has used the most “sophisticated in revolutionary Bunny AI Technology” to make sure that these cuddly rabbits will be just as annoying in-game as they will be in real life by eating all of your precious crops when they are hungry. As if all of this wasn't enough, the new “Biome Settler Pack I”, which includes the first series of “forest, tundra, and desert biome-inspired packs” and more than 24 new character skins has also been released at $1.99 or your regional equivalent. The free update for Minecraft: Windows 10 Edition Beta is live right now and you will be prompted to download the update if you haven't done so already.